The presidential race has shifted to the post-first-debate phase. 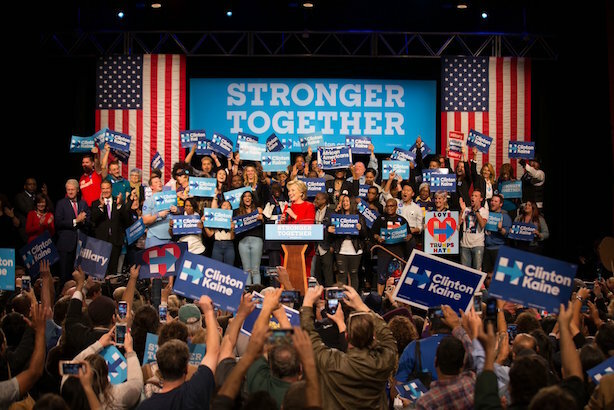 Hillary Clinton hit the campaign trail on Tuesday after her first debate against Donald Trump. (Image via Clinton's Twitter account). Presidential race shifts to post-first-debate phase. Hillary Clinton is looking to take advantage of what most observers saw as a win for her in the first debate against Donald Trump, while the Republican candidate is taking aim at moderator Lester Holt, a former Miss Universe, and the debate microphones. Eighty-four million people watched the event across 13 networks, a record for presidential debates. On the campaign trail: Former Miss Universe who says she was body-shamed by Trump speaks with Cosmopolitan. Howard Dean stands by cocaine comments. Republicans struggle to explain Trump’s contrasting climate-change tweet, debate comments. Sean Hannity criticizes journalists’ "expensive wine lifestyles." Clintons, Obama to attend Shimon Peres funeral. Wells Fargo CEO takes a pay cut. The bank’s chief executive, John Stumpf, is taking a pass on $41 million in salary and stock and not taking a paycheck while Wells Fargo is under investigation. Its head of community banking will also forego $19 million in unvested stock. Sen. Elizabeth Warren (D-MA) told Stumpf last week that he should resign and face criminal investigation. ADL calls Pepe the Frog a hate symbol. The Anti-Defamation League listed the little green darling of the alt-right as a hate symbol on Tuesday. The cartoon had innocent beginnings and was previously used in harmless memes before it was co-opted by internet trolls harassing Jewish and other users on social media. Police shooting aftermath caught on Facebook Live. The moments after a fatal police shooting of a black man outside San Diego were broadcast on Facebook Live on Tuesday. Friends of the man, who has not been identified by police, say he suffered from mental illness. Musk lays out Mars plans. Elon Musk’s plan for sending human beings to Mars in the near future may or may not work, but it’s a success at getting publicity for the entrepreneur. The Tesla CEO said humans could be living on the Red Planet in a self-sustaining colony as soon as the next five decades. Manned missions could begin as soon as 2022, he said, but the price of a ticket is $200,000.